← Not more snow pictures! 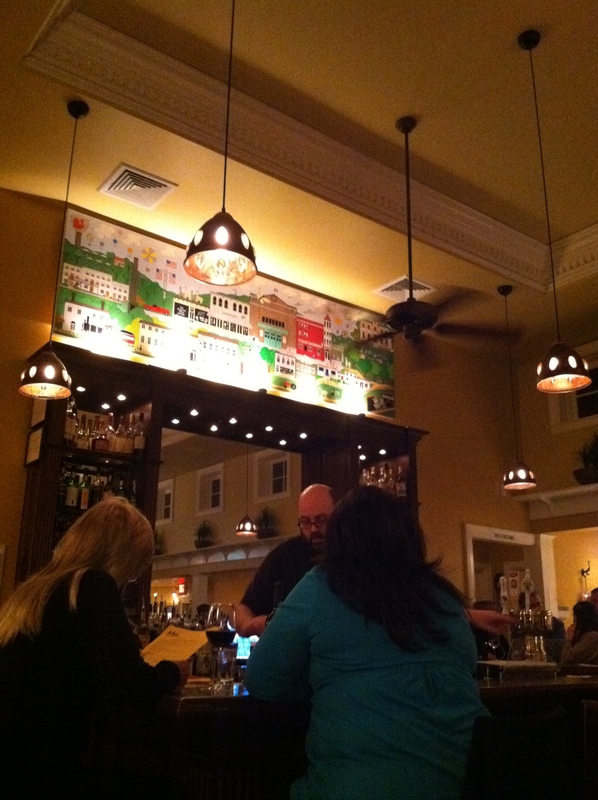 If you go to the MP Dining Company (formerly Cafe 4) and look over the bar, you’ll see a large painting depicting Mineral Point life, in a Richard Scarry, kind of way – which is funny because I often feel that Mineral Point is a lot like a Richard Scarry book come to life (except most of us are human). The painting is by singer/songwriter Rick Harris. You have to go there to really appreciate it. Rick and his band The Cozys performed a benefit concert with Point Five last weekend at the Opera House and in case you missed it, or you’re wanting more, the place to be tonight (Feb. 23, 2013) is the Gray Dog Deli, where the Cozys (Rick Harris, Scott Moore and John Birner) will be performing from 7-9. HSB: You mentioned that you’re retired. What did you do before you retired? RH: I worked for 32 years at General Electric assembling cat-scanners. I was a union steward for 23 yrs., something I’m very proud of. I became a professional musician at the age of 11. In 1966, at the age of 15 I quit school and went on the road. I was a drummer back then. I’ve worked at many different things including, horse ranch, foundries, and Soo line railroad. I have two grown daughters and four grandsons. HSB: Why did you decide to live in Mineral Point? RH: I moved to MP because I had met so many supportive people in the community and this is the most beautiful area of Wisconsin. HSB: What’s your favorite thing to do on High Street? RH: My favorite thing to do on High Street is to hang out at the Stairway Gallery and make sure Steve Swagerle doesn’t get much work done. I’m pretty good at it too! HSB: And now for today’s wrestling reference, did you wrestle in high school? RH: No, just with girls. For a short sampling of Rick’s work, check out this YouTube video as Rick sings along to a showing of his some of his paintings. Enjoy! Gallery | This entry was posted in Art, Entertainment, Food and tagged Gray Dog Deli, John Birner, MP Dining Company, Point Five, Richard Scarry, Rick Harris, Scott Moore, Stairway Studio Gallery, Steve Swagerle, The Cozys, The Hays. Bookmark the permalink.